A NASA-funded study (PDF) has establish that the cost of lunar missions could be reduced by a factor of 10 using some special techniques – and it could also help in starting colonies on Mars. The wide-ranging NexGen Space study by the National Space Society (NSS) and the Space Frontier Foundation (SFF) said that partnerships with private firms could send humans to the Moon for $10 billion (£6.4 billion), rather than the previously projected $100 billion (£64 billion) that had turned off potential supporters. Using fuel sourced from the Moon – specifically water and hydrogen – could also significantly reduce the cost of space travel further into the Solar System. NSS Executive Committee Chair Mark Hopkins said in a statement “A factor of ten reduction in cost changes everything,” The aim of the study was to see if public-private partnerships and other methods could effect in a low-cost and low-risk method to send humans to the Moon while helping future missions to Mars, called as Evolvable Lunar Architecture (ELA). The research points to NASA’s effective investments in private spaceflight so far through its COTS and CRS programs. By 2017, two crewed spacecraft are set to launch as an outcome of the subsequent Commercial CrewProgram – SpaceX’s manned Dragon capsule and Boeing’s CST-100. Heavy-lift rockets are also in manufacturing phase, especially SpaceX’s Falcon Heavy and United Launch Alliance's (ULA) upcoming Vulcan rocket that could be used to send astronauts there without depending on NASA’s costly Space Launch System. In almost five to seven years, the research says the U.S. could send astronauts to the Moon for $10 billion (£6.4 billion), less than $2 billion (£1.3 billion) a year. 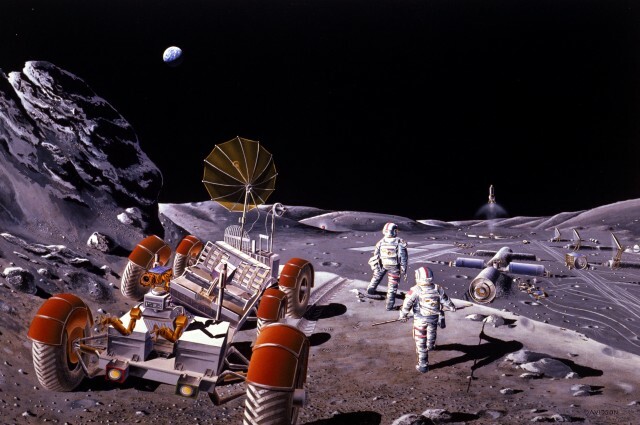 In next 10 to 12 years, it says that a four-person industrial base on the Moon could be active, which would require $40 billion (£26 billion), slightly less than $4 billion (£2.6 billion) a year. Both of these suggestions could be covered by NASA’s present deep space human spaceflight budget, which almost about $4 billion a year. The study also suggest producing an International Lunar Authority, “modelled after CERN,” to achieve the combined business and technical risks of lunar missions. It said “A permanent commercial lunar base might substantially pay for its operations by exporting propellant to lunar orbit for sale to NASA and others to send humans to Mars, thus enabling the economic development of the Moon at a small marginal cost,"
Right now, NASA does not have plans to send humans to the Moon. It is using its Asteroid Redirect Mission (ARM) – sending humans to an asteroid – as a cheaper stepping stone which could help sending humans to Mars. But this study follows another by the National Research Council last year that proposes maybe a return to the Moon would be a better option, and it may even be cheaper.